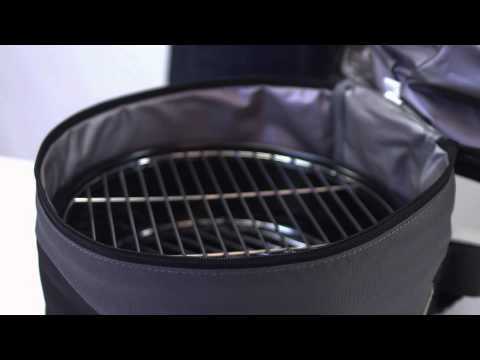 This two-in-one charcoal BBQ and cooler is perfect for any outdoor enthusiast. With a portable design,10-inch, chrome plated cooking grate and enameled fire bowl, you will easily cook up a delicious meal anywhere. The portable grill sits nicely inside of the tote underneath the removable cooler. The cooler easily zips to attach itself to the tote. Inside of the cooler is a durable and water resistant liner that can accommodate up to six 12-ounce cans. The tote features a durable shoulder strap, a carrying handle and an exterior pocket for added storage. Included with the Caliente is: one (1) 10-inch charcoal grill and one (1) removable cooler that both nestle inside of the durable, polyester carrying tote. 10 Inch Diameter 14 Inch Diameter 18 X 10" 16 X 10"